The pattern has four large flowers separated by overlapping crescent shapes. 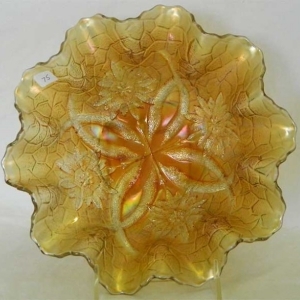 The reverse usually has the Soda Gold exterior–the same back pattern found on Dugan's Maple Leaf. 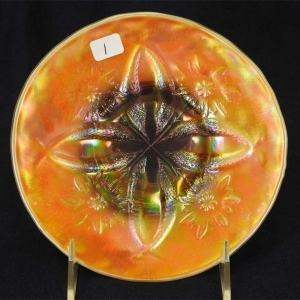 The Swedish glass maker, Eda, also made the pattern (large bowls, radium finish). 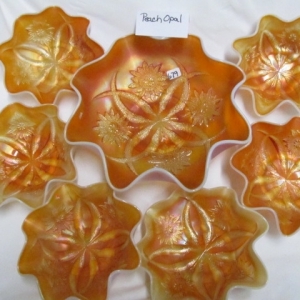 A similar pattern, Four Flowers variant, made in Germany by Brockwitz, has the same crescents and four flowers, but with the addition of buds located between the overlapping crescents (on all but the 7-7 1/2″ bowls). 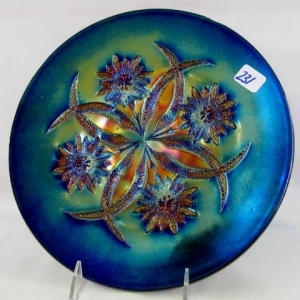 Left above is a spectacular ruffled Four Flowers bowl in purple with blue iridescence.